Xenia Shoe & Leather Repair is very respectful about the privacy concerns of the visitors to its sites on the Internet. As a general policy, no personal information is automatically collected from visitors to this site. However, certain non-personal information of visitors is recorded by the standard operation of Xenia Shoe & Leather Repair's Internet servers. This information is primarily used to provide an enhanced online experience for the visitor. Information tracked includes the type of browser being used by the visitor (e.g., Netscape, Internet Explorer), the type of operating system (e.g., Macintosh, Windows) in use by the visitor and the domain name of the visitor's Internet service provider (e.g., America Online, Earthlink). By having this information, web pages optimized for a particular visitor's computer are automatically made available to that visitor. Other use of this information may include internal review of the number of visitors to this site but only in an aggregate and non-personally-identifiable form. Xenia Shoe & Leather Repair only when voluntarily submitted by the user knows e-mail addresses and other personally identifiable data about visitors to this site. Xenia Shoe & Leather Repair affiliated web sites that are linked to this site and that engage in any additional information practices will explain those practices at that site. 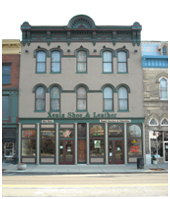 This site is controlled and operated by Xenia Shoe & Leather Repair at 21 East Main Street, Xenia Ohio 45385. The phone number is (937) 376-8156 or toll-free 1-888-227-0659. All material on this site, including, but not limited to images, illustrations, audio clips, and video clips, is protected by copyrights, trademarks, and other intellectual property rights which are owned and controlled by Xenia Shoe & Leather Repair, or by other parties that have licensed their material to Xenia Shoe & Leather Repair. Material on this web site or any web site owned, operated, licensed or controlled by Xenia Shoe & Leather Repair is solely for your personal, non-commercial use. Such material may not be copied, reproduced, republished, modified, uploaded, posted, transmitted, or distributed in any way, including by e-mail or other electronic means, without the express prior written consent of Xenia Shoe & Leather Repair. Use of the materials on any other web site or networked computer environment, or use of the materials for any purpose other than personal, non-commercial use is a violation of Xenia Shoe & Leather Repair's copyrights, trademarks and other proprietary rights, and is prohibited. This site may contain links to other web sites. The linked sites are for your convenience only, and you access them at your own risk. Xenia Shoe & Leather Repair is not responsible for, and does not endorse, the content of the linked sites, whether or not Xenia Shoe & Leather Repair is affiliated with sponsors of the sites. Xenia Shoe & Leather Repair welcomes links to this site. You may establish a hypertext link to this site, provided that the link does not state or imply any sponsorship or endorsement of your site by Xenia Shoe & Leather Repair. You may not use on your site any trademarks, service marks or copyrighted materials appearing on the Xenia Shoe & Leather Repair site, including but not limited to any logos or characters, without the express written consent of the owner of the mark or right. You may not frame or otherwise incorporate into another web site any of the content or other materials on the Xenia Shoe & Leather Repair site without prior written consent of Xenia Shoe & Leather Repair. The materials on Xenia Shoe & Leather Repair's web site are provided "as is" and without warranties of any kind either express or implied. Xenia Shoe & Leather Repair disclaims all warranties, express or implied, including, but not limited to, implied warranties of merchantability and fitness for a particular purpose, other than those warranties which, under the laws applicable to this agreement, are implied by law and are incapable of exclusion, restriction, or modification. Neither Xenia Shoe & Leather Repair, nor its affiliated or related entities, nor any person involved in the creation, production, and distribution of Xenia Shoe & Leather Repair's web site warrant that the functions contained in the materials will be uninterrupted or error-free, that defects will be corrected, or that Xenia Shoe & Leather Repair or the server that makes them available are free of viruses or other harmful components. The material that you read on Xenia Shoe & Leather Repair' web site is provided solely for entertainment and promotional purposes. Xenia Shoe & Leather Repair does not warrant or make any representations regarding the use or the results of the use of the materials in Xenia Shoe & Leather Repair' web site in terms of their correctness, accuracy, reliability, or otherwise. You expressly agree that use of the Xenia Shoe & Leather Repair site is at your sole risk. You (and not Xenia Shoe & Leather Repair) assume the entire cost of all necessary servicing, repair or correction. You expressly agree that neither Xenia Shoe & Leather Repair, nor its affiliated or related entities, nor any of their respective employees, or agents, nor any person or entity involved in the creation, production, and distribution of Xenia Shoe & Leather Repair's web site are responsible or liable to any person or entity whatsoever for any loss, damage (whether actual, consequential, punitive or otherwise), injury, claim, liability or other cause of any kind or character whatsoever based upon or resulting from the use of this site or any other Xenia Shoe & Leather Repair web site. By way of example, and without limiting the generality of the foregoing, Xenia Shoe & Leather Repair and related persons and entities shall not be responsible or liable for any claim or damage arising from failure of performance, error, omission, interruption, deletion, defect, delay in operation, computer virus, theft, destruction, unauthorized access to or alteration of personal records, or the reliance upon or use of data, information, opinions or other materials appearing on this site. You expressly acknowledge and agree that Xenia Shoe & Leather Repair is not liable or responsible for any defamatory, offensive or illegal conduct of other subscribers or third parties. Unless otherwise specified, the materials in the Xenia Shoe & Leather Repair web site are presented solely for the purpose of entertainment and promoting programs and other products available in the United States, its territories, possessions, and protectorates. This site is controlled and operated by Xenia Shoe & Leather Repair from its offices within the State of Ohio, United States of America. Xenia Shoe & Leather Repair makes no representation that materials in Xenia Shoe & Leather Repair' web site are appropriate or available for use in other locations. Those who choose to access this site from other locations do so on their own initiative and are responsible for compliance with local laws, if and to the extent local laws are applicable. This agreement shall be governed by, construed and enforced in accordance with the laws of the State of Ohio, as it is applied to agreements entered into and to be performed entirely within such State. Any action you, any third party or Xenia Shoe & Leather Repair bring to enforce this agreement or, in connection with, any matters related to this site shall be brought only in either the state or Federal Courts located in Greene County, Ohio, and you expressly consent to the jurisdiction of said courts. If any provision of this agreement shall be unlawful, void, or for any reason unenforceable, then that provision shall be deemed severable from this agreement and shall not affect the validity and enforceability of any remaining provisions. This is the entire agreement between the parties relating to the matters contained herein and shall not be modified except in, signed by Xenia Shoe & Leather Repair. On sites specifically designed for children, Xenia Shoe & Leather Repair makes a special effort to encourage children to consult with their parents before furnishing data. However, Xenia Shoe & Leather Repair believes that parents should supervise their children's online activities and consider using parental control tools available from online services and software manufacturers that help provide a kid-friendly online environment. These tools can also prevent children from disclosing online their name, address, and other personal information without parental permission. For additional information about parental control tools, please consult the "Consumer Assistance" page of the Direct Marketing Association home page (www.the-dma.org).